This cluster of groundnut flowers gives off a sweet, heavy scent. Clusters grow on leafy vines that climb without tendrils up about 5 feet on other vegetation in thickets near ponds, rivers, or trailside ditches. Each pea-like flower is about half an inch, and the vine has leaves with 5-7 large leaflets. The “groundnuts” are starchy underground tubers, which the Pilgrims ate in their first hard winters here, thanks to Native Americans who shared their knowledge of the plant. While strolling near a pond, stream, or wetland in August or September, you might notice a heavy, sweet scent and follow it, as an insect might, to its source: clusters of red-brown, fleshy flowers partly hidden along a leafy, twining vine. Brown flowers are always a surprise. These pea-like blossoms tend to start as reddish or maroon, so you’ll often find them in the “red” section of wildflower books as well as the “brown” section. 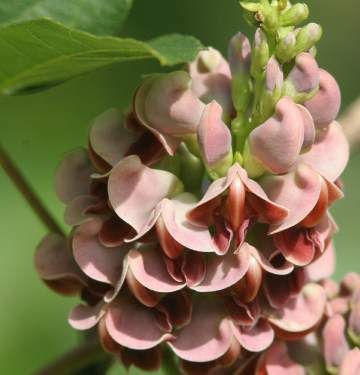 Groundnut (Apios americana) is a native vine now unfamiliar to most people but once a staple for Native Americans and a life-saver for the Pilgrims who came to the shores of Massachusetts. It helped to keep the Pilgrims from starving during their first harsh winters here in 1620s, thanks to the Native Americans who shared their knowledge of it. The goodies of groundnut are underground. The plant develops thick, starchy tubers along its underground stem, a few inches below the surface. These are the groundnuts, and they can be – and were – cooked and eaten like potatoes or dried and ground into flour. They can be as small as marbles or larger than ping-pong balls. Groundnuts are actually more nutritious than potatoes, with three times the amount of protein that potatoes have. As long as the ground isn’t frozen, people can dig the tubers. After a frost, the vines die back and the tubers become sweeter. Groundnut is in the pea and bean family (Fabaceae). The flowers too are edible. The plant also produces pods with seeds that can be boiled and eaten like peas. Groundnut has been called Indian potato for its tubers, and (like several other plants) wild bean for its pods and seeds. An Indian name for the plant was hopniss. For a long time, groundnut was one of nature’s edible treasures known to settlers and rural people. Henry David Thoreau, author of Walden (1854) and resident of nearby Concord, dug and ate groundnuts one winter and commented on the agreeable taste of roasted groundnuts. Even today groundnut is well known among people who enjoy foraging for wild foods. Anyone interested in sampling groundnuts or serving them to guests, however, should be aware that some individuals may have a rare adverse reaction to them, which may be an allergic reaction. Caution is wise. The plant is, after all, related to peanuts (native to Peru), which are also sometimes called groundnuts. Early European explorers brought groundnut back to Europe in hopes of impressing their sponsors with their discovery, as they did with other native North American plants and animals. The plant was cultivated in Europe but groundnuts didn’t catch on there. Another new food from the Americas – the potato from the Andes Mountains of South America – fared much better and was widely accepted in Europe in the 1700s. In 1845, when the potato blight struck Ireland, groundnut was presented as a possible substitute for potatoes but again failed to catch on. From 1984-1996 researchers at Louisiana State University worked to develop commercial varieties of groundnut, but the effort did not end up bringing groundnut to market. What happened to groundnut? Why does it represent lost knowledge today, instead of being commonly used and widely cultivated as a staple food, like potatoes? Part of the answer may have to do with the difficulties of growing groundnut on a large, commercial scale. For one thing, it takes two or three years for a vine to produce tubers large enough to harvest, so it can’t be grown as a yearly crop. Also, the vines need something to grow on, so they have to be staked, which is labor-intensive. Finally, the sprouting underground tubers send out rhizomes in all directions, making it difficult to keep them in neat rows for weed control with farm machinery. And, of course, we already have the potato – in many varieties. Even if people don’t grow it for food, groundnut is good for the soil. Like other legumes, or members of the pea and bean family, it enriches the soil with nitrogen, through the action of microbes that live in nodules that the plant produces on its roots. With fall and Thanksgiving approaching, think of nature’s bounty and remember wild plants such as groundnut, which helped to sustain Native Americans and European settlers and now still grows in our natural surroundings.